When students are present, the Course is open to members each of these days up to 15.30 hours & from 17.30 to 19.30 hours. On Wednesdays, Saturdays, Sundays & Bank holidays up to 13.00 hours, & from 17.30 to 19.00 hours. Each month, generally on the third weekend of each month, students are on a holiday break & the course availability has no restrictions for play to Clane Golf Club Members. There are mid term & other breaks in February, March, Easter and May when there is no restriction on the use of the course. Summer holidays commence in early June & only examination students will be present. 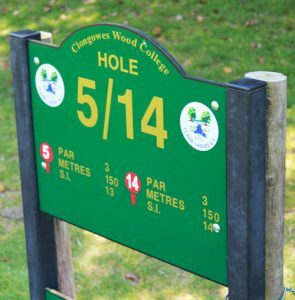 Whilst playing restrictions still continue during this time, the course is freely available for use by members for the remaining months of the Summer until the students return at the end of August. The weekend breaks will continue for the months of September & November, with the Mid term break in October & Christmas holidays.